I know this seems like an easy questions to calculate given that 300 hours is the target but I want to know how many hours people are putting in each week. I'm managing 12 hours, 9 throughout the week and 3 on the weekends. This is enough to reach 300 hours given how much study I've done but want to know if I really should be pushing harder. I'm also learning to program and keen to keep that up but want to ensure I'll pass Lvl1 first time. I'm started off L1 with weekends only, but 6 hours each day so 12 hours per week. Last two weeks I took off and studied full time, so about 6-8 hours every day. @mincemeat23 nice one, I've done a couple of 6 hour sessions and they are brutal! Thanks for letting me know and best of luck in June! Six-hour sessions will melt your brain, but they are good for building your endurance on Exam Day. For Level 1, I managed to get just under 21.5 hrs/wk (I was going to school last year, which gave me enough free time). Overall, my study time totaled 410 hours. Thankfully, I passed, however, I sacrificed time that I could have used for job hunting. I completely agree - I forgot to say I'm not doing them all at once. I go to a library, put in about 3 hours in the morning, then have a nice lunch and walk around the area, then another 3 hours in the afternoon. Like you say I'm trying to simulate the exam day! @junepass93 you Cray Cray Enjoy the grind and best of luck! Congrats on graduating and what role are you starting come July? 20 hours a week is enough for me. I segregated the topic weight wise and create weekly calendar for CFA level 1 preparation. I think the 6-hour session thing really varies from person to person. My roommate and I are both taking the CFA exam, and I can't go for any longer than 2-3 hours, but he basically grinds it out from morning till evening during weekends, stopping only to eat some pizza. It's unnerving. changing topics in between also helps! 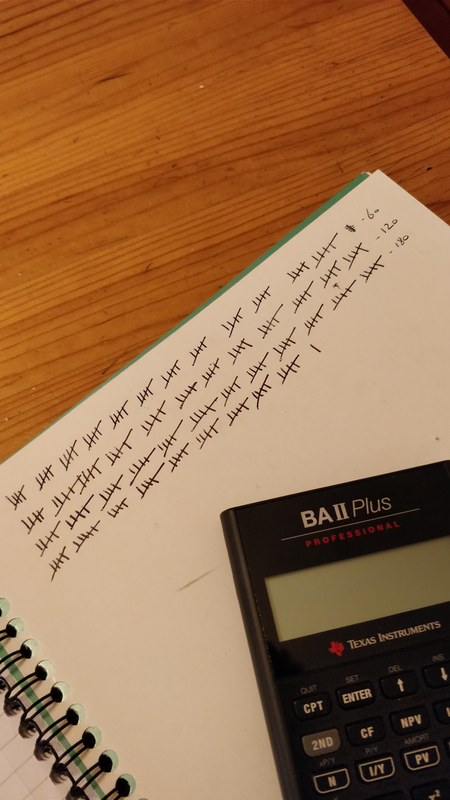 220+ because I started early, tallying it like a prison sentence It took me 180 hours to read all the material and answer end of chapter Qs but now that I am smashing out questions all the time, the info is sticking much better than after just reading it. Re-reading weak areas is working well for me. I 'reward' myself by checking off a successful study day on a paper calendar and logging the number of hours on it. Read it somewhere on the blog and it helps me add on just a little bit of study motivation. Best of luck though come December. Thank you encouraging words.........I hope for the best :-). Wish you good luck for your exams. Hey Preetujain, hope the studying is going well! Just thought I would let you know that I passed the level 1 exam in June and wanted to make sure you are still motivated!